A gorgeous huge arrangement of 100 red and yellow roses with lots of green fillers. 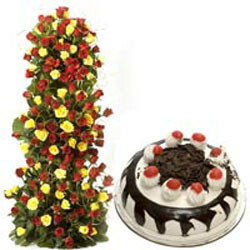 Standing elegantly tall this arrangement comes upto a height of 3ft to 4ft. The hamper comes with a 1/2 kg blackforest cake.